I have two finished Christmas projects to show you today! I feel quite good about getting things done on-time this year. Over the weekend I started drafting an ocean waves quilt pattern, with the intention it would become a pillow. I decided on a large block size to accommodate a 20" pillow form and quilted it in grid lines to accentuate the design. As you can tell I'm really into red and green solids right now! They look so fresh and crisp. I have a bunch of old quilting books featuring vintage quilt patterns and I couldn't help but be inspired by the traditional Christmas colour's and styles. These really pop. I especially love the Green and red with the white. I love their crispness, very scandinavian. I am making a mini quilt for a gift which has turned out quite christmassy. love your blocks! What quilting book are you using? They're beautiful. 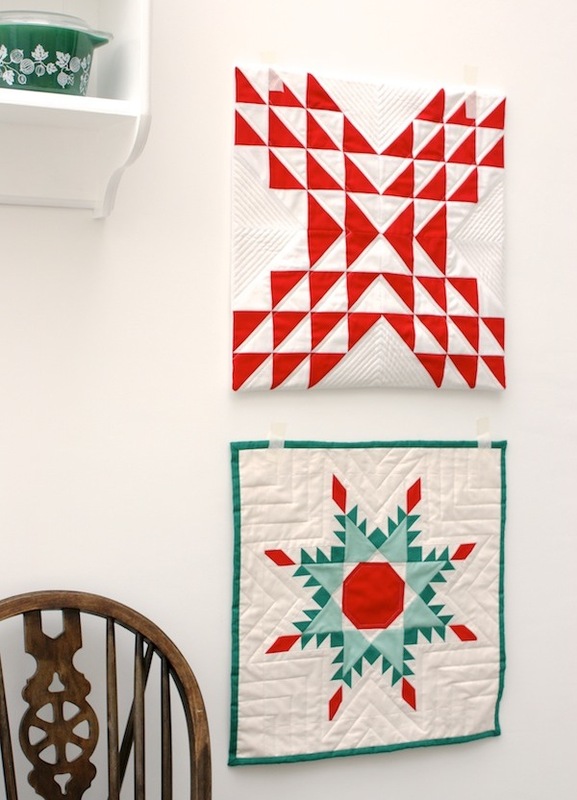 Those vintage quilts would fit in well with today's 'modern' quilts. Clare is right on! Very scandinavian.......love white and red. oh, these are lovely ! and so beautifully pieced, all points on display and perfectly pointy ! I do know how tricky that can be but you make it look easy. Oh so beautiful and Christmasy... and just love the festive Pyrex! so pretty! what colors did you use for the star quilt?